This article submitted by Linda Stelling on 4/21/99. The Paynesville Area Middle School teachers reviewed their list of students and announced the April Students of the Month. 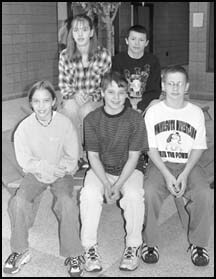 Representing the sixth grade are Stephanie Louis and James Jansen; seventh grade, Tim Shrupp and Amy Roberg; eighth grade, Stacy Person and Russell Leyendecker. Stephanie Louis (not pictured) is the daughter of Adrean and Jean Louis, rural Paynesville. Her teachers state Stephanie is a good peer helper, her work is always completed and ready for school, she is always willing and helpful when called upon in class, and is always smiling and cheerful. Stephanie lists as her hobbies collecting rocks, stamps, foreign money, and Beanie Babies. She is a member of the sixth grade choir, sings at church, is a Girl Scout and member of the church youth group. When asked about her feelings toward education and being chosen as Student of the Month, Stephanie replied, "My feelings towards it is excitement and education here is great." James Jensen (front right) is the son of Freda and Jim Jansen, Paynesville. His teachers state James is eager to help and cares about his school work and works to his ability. James lists as his interests wrestling, basketball, and soccer. He is a member of the sixth grade choir, basketball, and wrestling team. When asked about his feelings toward education and being chosen as Student of the Month, James replied, "Good, I have a very good education and I'm happy." Amy Roberg (front left) is the daughter of Gary and Fern Roberg, rural Paynesville. Her teachers state Amy is pleasant, well-mannered, polite, a good worker, and a willing helper. Amy lists as her interests stamping, scrapbooking, biking, skiing, and swimming. She is a member of the middle school student council, sings in the seventh grade choir, is a band member, plays volleyball, basketball, and competes in track. She is also a 4-H member. When asked about her feelings toward being chosen as Student of the Month, Amy replied "I feel very honored." Tim Schrupp (front center) is the son of Dave and Pam Schrupp, rural Paynesville. His teachers state Tim is a good thinker, a hard worker, polite, and helpful. Tim lists as his interests farming. He is a member of the seventh grade band and choir. He is a 4-H member and plays the piano. When asked about his feelings on being chosen Student of the Month, Tim replied, "It feels pretty good to know that I have been chosen as Student of the Month." Stacy Person (back left) is the daughter of Cheryl and Lee Person, rural Paynesville. her teachers state she stays on task, has a good work ethic and is always smiling. Stacy lists as her interests basketball, volleyball, and playing with her cat Lucky. She is a member of the eighth grade volleyball team. When asked about her feelings on being chosen as Student of the Month, Stacy replied, "Very excited and happy." Russell Leyendecker (back right) is the son of Robert and Lisa Leyendecker, rural Paynesville. His teachers state Russell is a very good listener, a hard worker, works well with others, and has a positive attitude. Russell lists as his interests basketball and baseball. He is a member of the eighth grade baseball team. When asked about his feelings on being chosen as Student of the Month, Russell replied, "Surprised."